The Hopper “Check Switch” or Test Installation is often the cure-all for satellite acquisition problems. 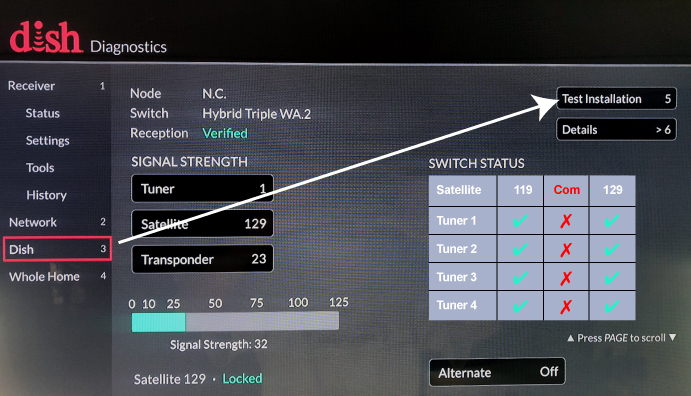 Each time you move your RV to a new location, you should perform a Test Installation to verify that you’re receiving all possible satellites — 110, 119, 129 for the Western Arc or 61.5, 72, and 77 (optional) for the Eastern Arc. However, sometimes doing just a simple Test Installation doesn’t work. For example, when using a DPH42 switch with the Hopper 3, some people (including me) wind up with a missing satellite like 110. In that case, use the Check Switch with Nuclear Option. Unplug any switch you’re using (a DPH42, DPP44, etc). Plug your Hopper and any switch you unplugged back in. After your Hopper completes its start-up sequence, perform the standard Test Installation again (steps 1, 2, and 3 above).